Well hello my friends! Long time since you heard from me! Nothing much has been happening really until my latest holidays in the Northern Territory. I had an amazing 11 day trip from Darwin to Alice Springs. I have lots to tell you but first let me impress you with some cool facts about my trips! But let me start at the beginning of my journey, which started on July 27th. I boared my flight from Sydney to Darwin at 07.40pm and arrive in Darwin at 11.55pm. I stayed at the Cavanaghs hostel. I had to share a dorm with two guys! Which was new for me since I have always shared with girls! Well what can I say! I didn't sleep so good as one of them snored throughout the night! I nearly wanted to throw my pillow at him but luckily for him he stopped ha-ha!!! Eventually morning came! I was up for my 6.30am pick-up. Unfortunately for me I had forgotten to put my clocks back 30mins! so I was there over an hour early dope!! Anyways, I got on this very uncomfortable bus and the guide introduced herself to the group! she ended up not being a very nice guide! rather miserable in fact and rude! I think she did not want to be there and it was a pity for me because it was the start of my trip. However I did enjoy the trip and the sights. I made some nice friends from Holland and Scotland, who would join me on my next trip. Anyways, off we go to our first destination, swimming in beautiful waterfalls at several gorges at Lichfield national park, about 2 hours away from Darwin. The falls were amazing and the temperature of the water was perrrfect.... The only thing that spoilt it was that we didn't have enough time to enjoy the sights as we had to stick to the itinery. This was followed by a special boat on the marry river. Here we saw crocs, birds, cows, kangaroos, etc. The wildlife was incredible and so natural. It felt as if I was on safari. We got up real up and personal with the crocs and they looked very hungry... We tried the local cuisine which was nut like taste from the seeds of the lotus leaf and a celery taste from the stem of the plant. Fascinating information about how the animals and aboriginal survived from the land. I really enjoyed that afternoon but was ready to hit the sack by now, as I had been up so early. Day 3 was good and bad! I will explain. It started off great! We hiked to Jim Jim falls which were very impressive! Swam and took in the scenery, perfect. We then hiked over big massive rocks, which must have taken about 40mins to get to Twin Falls which was also fantastic (even without the fall not falling!!!) It was here when it started to get bad for me lol. The water was freezing so I thought I would just take a Very very quick dip! Well I walked in very slowly as you do and managed to slip as I was going in the water. There I cut my foot! Ouch!! wasn't a big cut but it hurt all the same! so great! well that was enough for me, I got back out and dried myself lol.. big woos I know. So after everyone had taken a swim we made our not soo fun way back through these horribly big rocks. I was going great when I fell on my arse lol.. I was good but I must have gotten up to soon and I sprained my ankle! this ankle causes me nightmares as I am always falling on it awkwardly. It was very painful. I limped my way back to the bus and the following day I had this massive blown up ankle, great luck!!! However, it did heal rather quickly and I didn't have problems with it again. So my 3 day 4WD Darwin tour came to end and I stayed one more night at the Cavanaghs hostel. That night we all had dinner together and enjoyed the little sights of Darwin (pub and back to hostel he he) But I couldn't totally relax as I had Yet another early start the following morning. The next tour was really good! I will keep you in suspence and continue with my journey another day, as It's getting late I am getting tired. But for now hold on tight for the next episode in the adventures of maggie.d down under coming to you soon... heheh!!!! Hey guys sorry I have been soo long in writing again! it's been crazy. I am doing a tennis coaching course so that has been taking a lot of my time. No excuse I know lol! 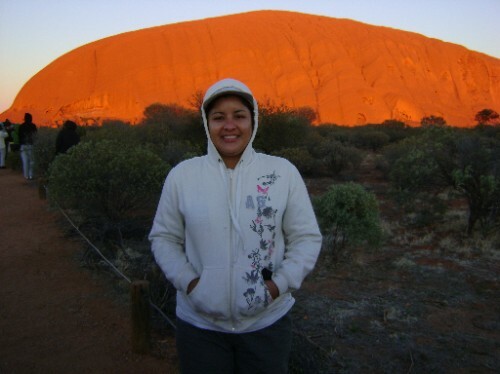 !So where was I. Oh yea Red Centre Trip. So got up at a UnGodly hour: 5.30am for my next trip to Alice Springs. Our first stop was the Outback Camel Farm. It was basically a short stop to get refreshed and have brekkie. You had the choice of riding the camels but I wasn't really interested to be honest, as I already know a lot about camels, if you remember I worked at Camel farm in Yeppon, Queensland. We were off to Uluru next, in the heart of the Red Centre. After lunch, we explored fascinating Kata Tjuta (the Olgas) on a guided interpretive walk through the Valley of the Winds. We maked it back to camp in time for an not so exciting desert sunset over Uluru. I have to be honest I was very dissappointed with the sunset, we rushed to see the Olgas to catch this sunset and it wasn't worth it lol!! After dinner, I curled up in a swag (Aussie bedroll) and watched the stars come out to play in the darkening sky. It was great, very cold but nice to ponder on the wonder of the world looking at the stars!! The next day again we got up soo early lol!! I hated the early mornings! am not a morning person at all... We got up to see again unimpressive sunrise over Uluru. It hardly changed colour, could have stayed in bed grrr... I was feeling nervous today as I was going to climb the Big Rock! was I mad! was not looking forward to the big climb! I was glad that there were four of us in the tour that were going to climb it. And to be honest I don't think I would have made it without them! Thanks guys!! Especially Juergen, we were an angel!! I only got up a quarter of the way and I was ready to come back down! You have to be soo fit cos it's soo steep and you have to pull your weight constantly as you are climbing. But I was determinded to make it to the top and I did! YIPPPPY!!!! I was gald when I came back down and could even have kissed the ground if hadn't been soo dusty ahahah!!!! We did it in two hours yeaaaaa!!! Afterwards the guide took us on a mini walk. She explained the sacred sights and rituals of the Aboriginals. I love the DreamTime stories!! They are soo magical, they make me feel like a kid again!! I have such compassion and love for thier culture and thier great spirit. They made a massive impression on me that I will never forget the experience. We had some time to look at the Cultural Centre, where there were Aboriginal ladies doing some painting. It was lovely to see them.I wanted to get a painting but found they were too expensive and waited untill I got back to Alice Springs, where I got a bargain in the end. We then made way to Kings Canyon. We spent the night at our permanent campsite at Kings Canyon Resort. We all had to help with cooking dinner. It was ok to start off but by now I was getting a little tired of cooking!! I guess when I am on holiday I like everything to be done for me lol!! But I accepted that it was this type of holiday. Day three was spent exploring Kings Canyon. It was magnificent! We checked out the Amphitheatre, Lost City, the lush and ancient Garden of Eden and the sheer outcrops of the North and South walls. After lunch, we travelled along the well-known Mereenie Loop Track (also called the Red Centre Way) where we checked out the 140 million year old meteorite crater, Gosse Bluff. We passed by the home of acclaimed Indigenous artist Albert Namatjira as we traveledl towards Glen Helen, where we spent the night in our permanent campsite nestled in the western end of the majestic MacDonnell Ranges. Day four was spent discovering the spectacular geological features of Ormiston Gorge, before we going back into the vehicle for some 4WD action through the ancient track of the Finke River. Most that day was spent at Palm Valley and Cycad Gorge, exploring what was once a prehistoric inland sea. We saw the Livistonia Mariae, a tropical palm and one of the rarest trees in the world. The spectacular Western MacDonnell Ranges continued to impress us all the way back to Alice Springs. So we finally arrived at Alice Springs. The following day I flew back to Sydney. My holidays in the Northern Territory and Red Centre was amazing and an experience I won't forget in a long time. The highlighst for me were the getting to know more of the Aborignal people, climbing Uluru of course and the beautiful sights of the gorges and wonderous animals and not forgetting swagging it under the spectuacular starts!!! I think this trip has to be the most spritual trip I have ever had. It made me closer to the land, animals, nature and the real people of australia. So as one journey end another begins. I will be in Sydney untill mid December. Then my next adventure commences. I am off to New Zealand for xmas and new year! Yea baby!!! how exciting is that. I am in the middle of planning my trip! I am trying to get a travel buddy so can share the expenses of hiring a car to view the sights. I am looking for a tour too but I think I like the idea of just getting on a plane and arranging something as I go along! it's more interesting that way! So my dear followers, I will keep you posted on my plans to New Zealand. I will try not to make it too long next time! !